Rhinos and tigers, oh my! China says it will allow trading in products made from endangered tigers and rhinos under “special circumstances.” The ruling reverses a 1993 ban and brings strong criticism from conservation groups. Traditional Chinese medicine uses tiger bone and rhino horn—without proof that they treat illness or concern for the damage to wild animal populations. The same is true for elephant ivory. Chinese demand for it is blamed for driving the slaughter of African elephants, though Beijing placed a ban on all ivory trade starting this year. Despite the 1993 tiger products ban, China has long allowed tiger farms, which harvest the bones of dead animals and promote their sale for “medicinal purposes,” according to a study by the Environmental Investigation Agency, a British nonprofit. The World Wildlife Fund says overturning the ban would have “devastating consequences globally” by allowing poachers and smugglers to hide behind legal trade in tusks and bones. An estimated 3,890 tigers remain alive in the wild, according to a 2016 report. Thousands are also believed to be bred on Chinese farms. Studies put the population of wild rhinos at fewer than 30,000. Poaching reduces that number drastically each year. What does it mean that China’s new ban would allow poachers and smugglers to “hide behind legal trade in tusks and bones”? What should a Christian's response to this story be? That tiger looks kinda hungry, his bones stick out like a milk cow's. Rhinos are awesome, we must save them! Its so sad how poachers are killing animals for game and money. what could I do to help? suggestions? That is so sad! I wish someone could stop them! are the tigers bones ivory? No, the tigers bones are not ivory. Ivory comes from the tusks of elephants (and some other animals), but not from tigers. Hmm, as long as they aren't poaching animals the from the wild and doing this legally I think it's fine for China to do this, maybe as long as other countries don't start doing this too. Although I love tigers and don't want them killed. That gy is going to get eaten gy that skinny tiger! I think poaching animals is horrible! So much animals are becoming extinct! Dodo bird, black rhinos, quagga, tasmanian tiger, sea cow, wooly mammoth, pandas almost died, and there is so much horribleness to animals! I'm sorry if it seems like I'm overreacting, but I LOVE animals! I don't think out are overreacting I think you are just telling your opinion. thats soooo sad that there are only 3,890 tigers left only 30,000 wild rhinos left in the world!!! :( I love Tigers and Rhinos too!! 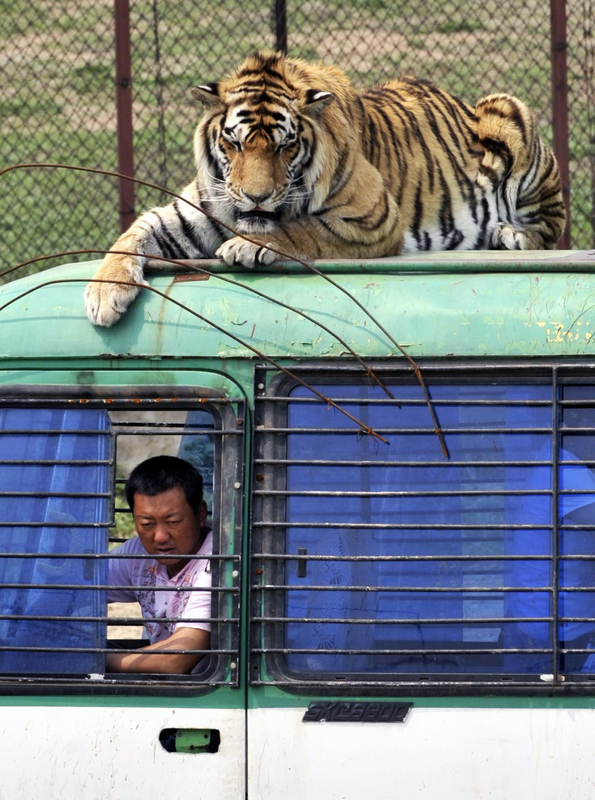 "eye on the tiger" is also another documentary about the tigers. if any of you would like to read it!!! no that's not right, I agree with Isabel B there have been so many animals that were driven into extinction that we know of and were never able to enjoy. There may have been several more species that were killed off that we might never know existed. I don't want tigers and rhinos to be among the animals that future generations will never get to admire the majestic beauty of because of humans selfishness, greed, and sin. I don't think this law is right, God told us to have dominion over the earth and animals. Not massacre them!